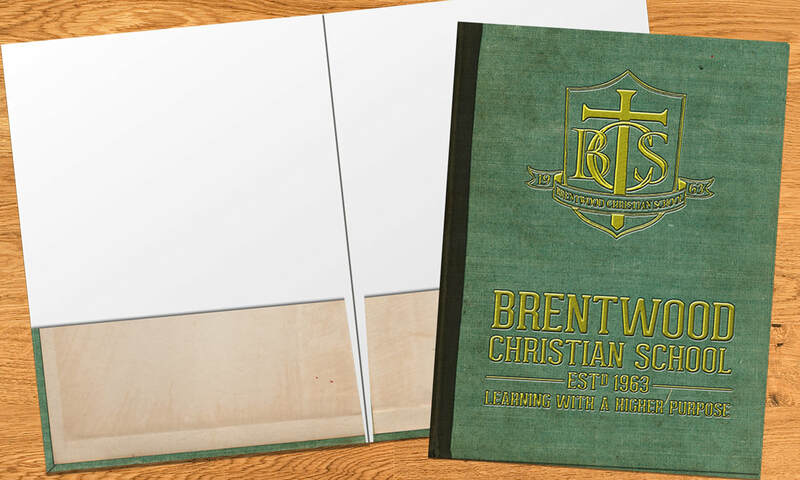 Brentwood Chrisitan School is a private christian school located near Austin, TX. For this project the admissions department needed some new folders, which they use to hand out packets of information to the parents of prospective students. After floating a few different ideas, we landed on the idea of designing them to look like an old textbook, complete with the school crest, name and tagline in a gold emboss effect. We were all pleased with the end result! 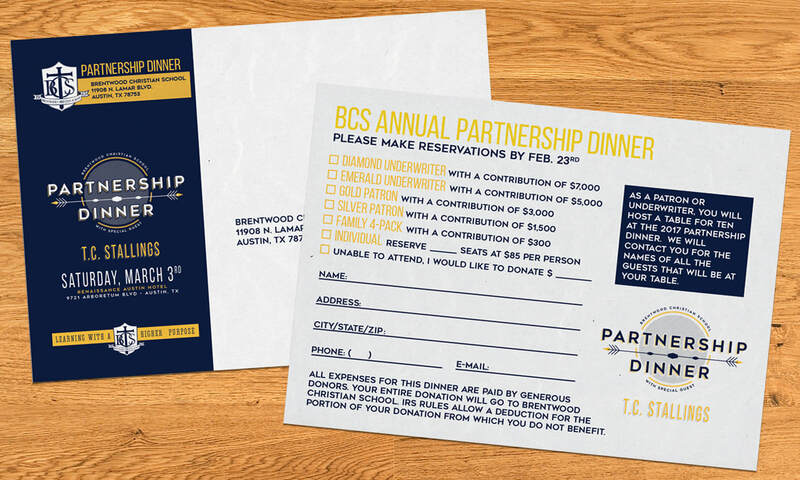 This project includes all print materials, including save-the-dates, formal invites (not pictured), RSVP cards, and event programs, for one of Brentwood's fundraisers that they do each year. This was the design theme used for 2018. 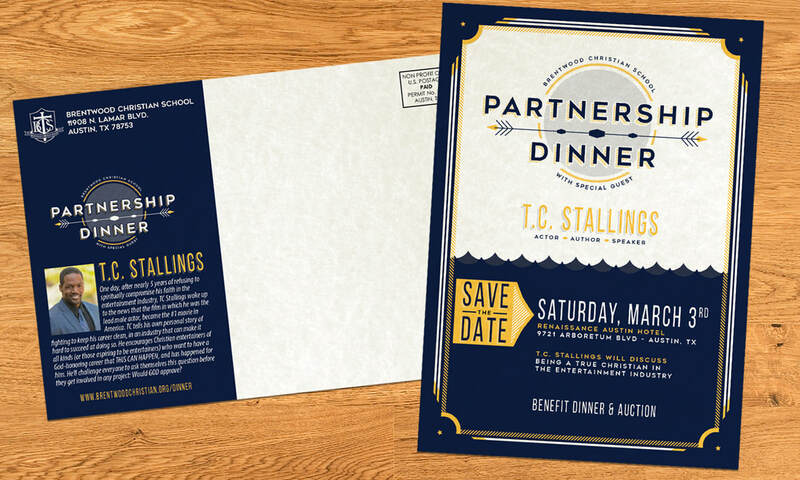 Side Note: good planning is key to having successful marketing materials for an event. In this case all the design work for these is done at the same time and distributed at different times throughout the year. That way your target audience sees consistent branding for the event throughout the year. This is a digital magazine. Click and drag the corner to turn pages. (Note: This will not work on mobile devices. If you are on a mobile device click here to view. Brentwood's Insights Magazine is an annual publication they put out every year for student families and prospective student families. It is an effective way for them to share highlights of the previous year and new developments for the upcoming year. This 20 page magazine is obviously a fairly large project that takes quite a bit of collaboration to bring the stories, photography, graphics and layout all together. In this case, the photography and stories were provided by Brentwood and the layout, graphic artwork, and photo editing are done by me. ( Although, I do have a lot of experience in creating custom content if that is something you need. I also have many years of experience as a photographer and I happen to married to an even better one, so if you are located in north central Iowa or are willing to pay travel expenses, that is also a service we offer.) The below file is from the 2015 issue, which I know isn't the latest edition, but this one is my favorite. ​This is a digital magazine. Click and drag the corner to turn pages. (Note: This will not work on mobile devices. If you are on a mobile device click here to view. 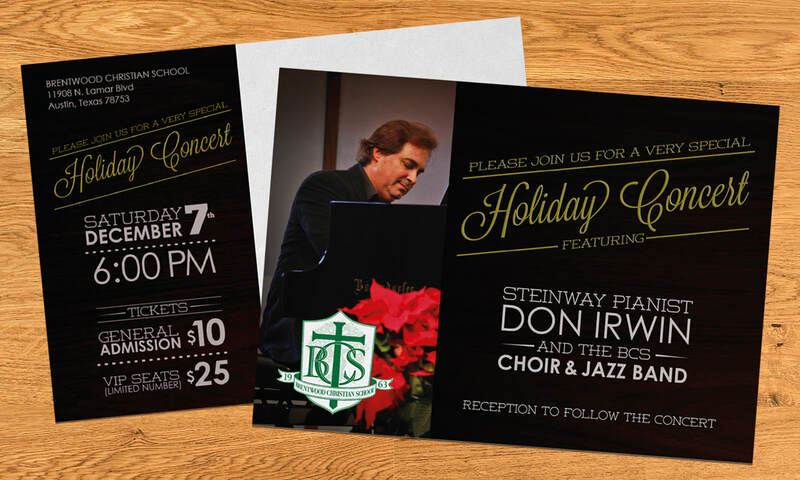 This is a postcard mailer to announce a special fundraising event. This is one of my favorite projects that I look forward to every year! Each year Brentwood selects a verse that they use as their theme throughout the year. 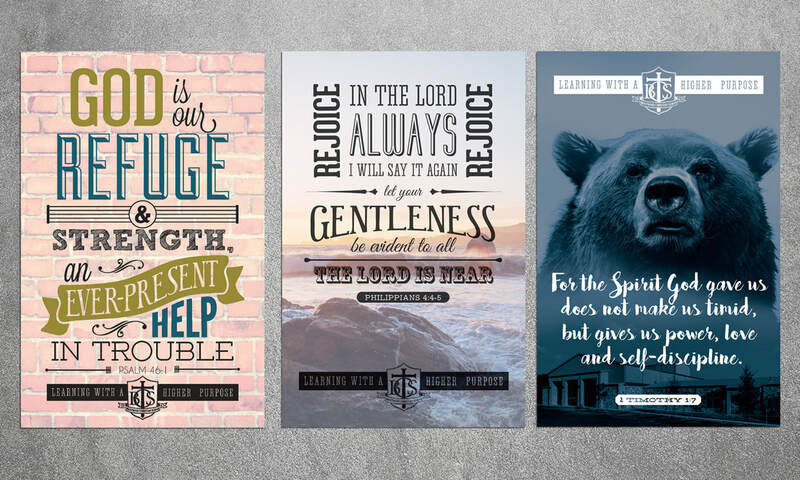 They like to brand their theme with these "Scripture Posters" which they hang all around their campus and convert the design into t-shirts as well (not-pictured). This poster, was in particularly fun​! 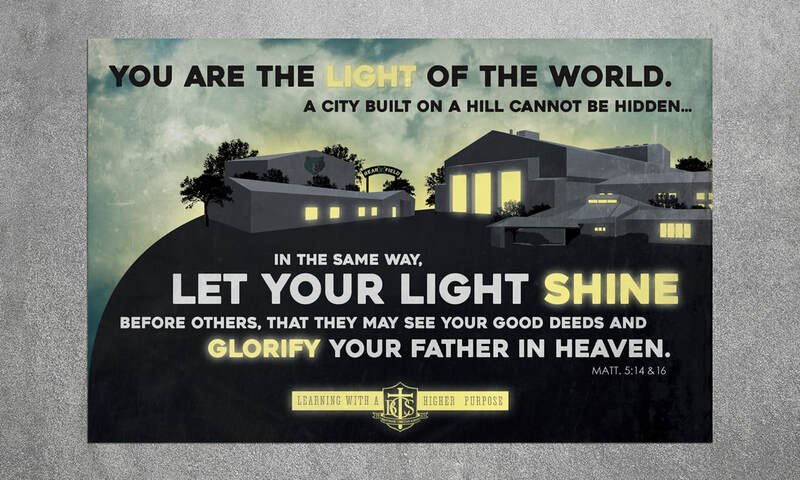 This year they wanted to incorporate some of their buildings and landmarks from their campus into the design of the poster. Using some pictures they sent me as a guide, I was able to reconstruct these structures into vector artwork which was used in this design to give it a highly customized feel. The overall results were very unique and just plain cool (in my humble opinion.... and theirs). 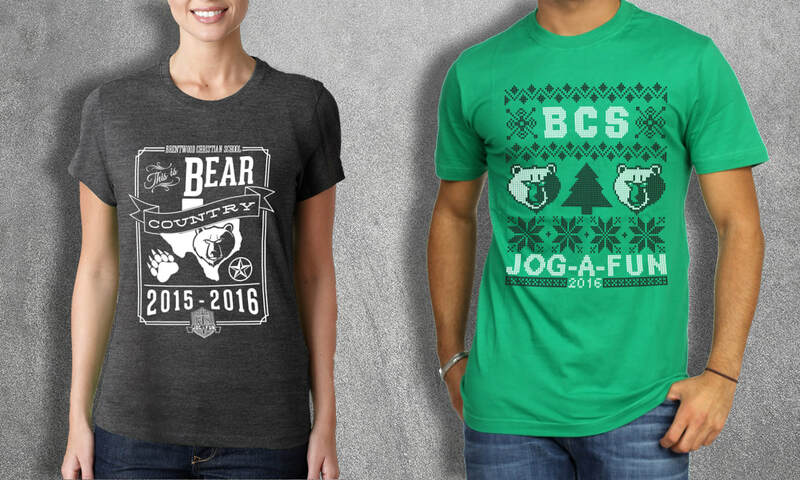 For this fundraising event, Brentwood likes to promote through custom branded t-shirts. I work with the event coordinators to help them develop their ideas for the artwork and put it all together into a print-ready design. I love t-shirts!